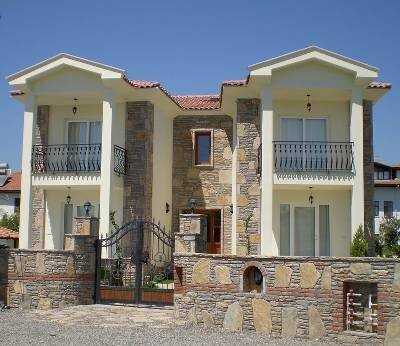 A New Apartment ideally situated in the lovely town of Dalyan. Great Views of the Mountains and surrounding area. Very close to all amenities. This modern Apartment is very spacious inside with the combined Lounge/Kitchen/Dining Room at the front. As you head towards the back of the Apartment are the two bedrooms. The Double Bedroom has access to the spacious rear Balcony through a sliding door. The second Bedroom has 2 Single Beds. The interior of the Apartment is very tastefully and modernly decorated. Everything is brand new and laid out very well. There is a large Balcony overlooking the Garden Area which is ideal for outside dining or just relaxation. There is a traditional Stone Barbecue in the Garden near to the large Swimming Pool. The Garden is well looked after and is very private. There is sufficient space outside to park several cars. There is also outside lighting in the Garden and Pool. This Apartment is ideally situated for everything you could want to do in and around Dalyan. There are 2 Supermarkets within 5 Minutes walk, the Centre of Dalyan with Bars, Restaurants and Shops is also within 5 Minutes walk. Right beside the Apartment is a Storks Nest which can provide great amusement in the summer months. There are also great views of the Mountains. Due to the location of the property and the good local transport links, Car Hire is not essential, but can be arranged if necessary. If this Apartment is not available or you need 2 Apartments please try Property Ref: 63927 which is below this Apartment. Views of a Storks Nest which is very close to Apartment. Beautiful Mountain Views in all directions. A Microwave is available on request.